Bradford Soundscreen Insulation Batts-What are they? Do they Work? 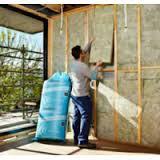 Home / Bradford Soundscreen Insulation Batts- What are they and Do They Work? Bradford SoundScreen Insulation Batts seems to be everywhere you look these days! 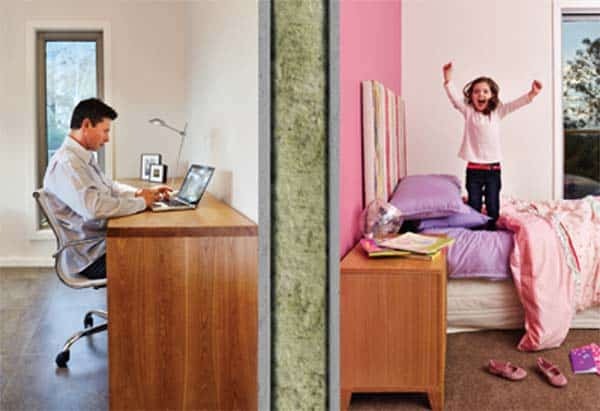 Read just about any article about soundproofing within the construction industry and invariably Soundscreen will get a mention, so a pat on the back for the Bradford Soundscreen PR people! 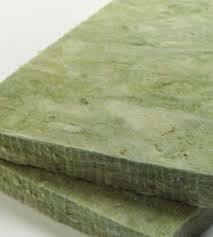 But what are Bradford SoundScreen Insulation Batts? And more importantly, Do They Work? how do Bradford Soundscreen Batts compare to their better value equivalent, Pink Soundbreak Thermo Acoustic Insulation Batts? 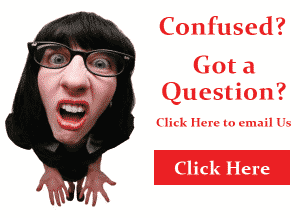 What are Bradford SoundScreen Insulation Batts? SoundScreen Insulation Batts are an acoustic / thermal fiberglass insulation product manufactured by CSR Bradford in Australia. Essentially Soundscreen is a High Density fiberglass insulation batts range that you can install into the ceiling, walls or underfloor areas within residential or commercial properties. They act as thermal & acoustic (temperature & sound) insulators and can easily be substituted for normal thermal insulation batts. 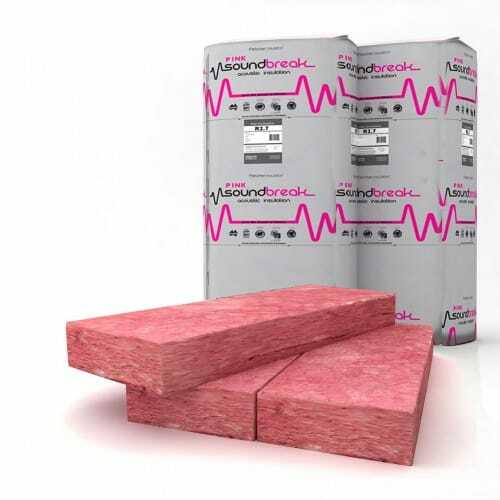 Soundscreen Batts are the CSR Bradford equivalent of Pink Soundbreak Thermo Acoustic Insulation Batts, that are manufactured by Fletcher Insulation. The Soundscreen and Pink Soundbreak product range are identical, with batts available 1160mm long by either 430 or 580mm wide to fit standard residential / commercial stud widths. Both ranges also offer thickness’s from 60mm to 110mm and ‘R’ values of R1.7, R2.0, R2.5, R2.7 & R3.1 so there is a SoundScreen or Pink Soundbreak batt to fill your needs. How Do Bradford SoundScreen Insulation Batts and Pink Soundbreak Batts Work? Both batt ranges are manufactured at higher densities than normal thermal insulation batts and are specifically designed to filter out noise, offering somewhat greater sound control than regular insulation. The higher density means an increase in the fibre mass, and the more fibers the more sound is absorbed. To be most effective, Soundscreen soundproofing should be installed correctly without any significant gaps that can permit sound waves to escape. Of course, whilst you do not need a skilled professional to install Soundscreen correctly, when it comes to getting the best out of Soundscreen insulation, it is recommended. Compared to a wall without Bradford SoundScreen, the numbers are significantly higher. Accordingly, you can conclude that SoundScreen can block up to 75% of the sound waves (unwanted noise) when correctly installed for acoustic insulation purposes, and this will be the same for Soundbreak too. Where Can Bradford Soundscreen Batts be Installed? When you’re installing a soundproofing system, you need to consider where the larger percentage of the unwanted noise is coming from. If you live in a relatively quiet area but have active children, home theaters, teenagers fond of loud music and video games, noisy kitchen appliances, etc, the majority of the unwanted noise is coming from within the house. SoundScreen works to control the noise indoors. So if you line the internal walls around your home theater, the kitchen, and the bedrooms, noise from inside won’t escape and noise from outside won’t come in. That’s something you’ll really appreciate when you want to rest after a hard day’s work. We recommend the use of 60mm R1.7 batts for interior walls between bedrooms and bathrooms, and 70mm R2.0 or 90mm R2.5 for home theatre room walls or other noisy areas. You’ll be amazed by how much noise is reduced by installing an indoor acoustic insulation system. However, no amount of indoor insulation will effectively block the noise coming from outside the house. If you’re living in a densely populated metropolitan area or suburb, especially near an airport, train station or park etc, you might find that the noise pollution is nearly intolerable at times. In such cases, it’s best to line your exterior walls with SoundScreen insulation or Soundbreak. Correctly installed, the batts will dramatically reduce the levels of unwanted sound that would normally enter your home. We recommend 70mm R2.0 or 90mm R2.5 Soundscreen batts for external walls, depending on the cavity depth available. If your unwanted noise issue stems from noisy neighbours above you in an apartment block or falling rain or prancing possums on tin rooves, then we recommend installing 110mm R3.1 Soundscreen batts to alleviate the problem. SoundScreen is simply a wonder insulation that helps create the quiet zone you need to find the peace you want in your home and your life. 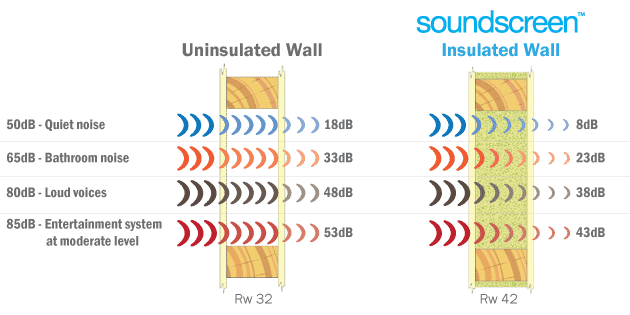 Both Soundscreen and Soundbreak Batts are excellent products manufactured by Australia’s leading Glasswool Insulation Manufacturers. Both product ranges provide similar results in significantly reducing sound transmission through walls, floors or ceilings in your home or commercial property. Both can be used in exactly the same applications. So why choose one over the other? Well, for our money it just comes down to price. 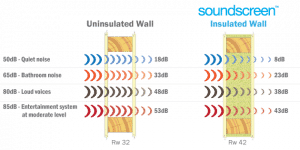 At Soundproofing Products Australia, we can offer you both products, but we continually find that Pink Soundbreak batts tend to be better value. 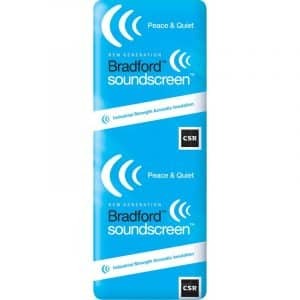 To order Bradford Soundscreen at the best available price, or to get more information or advice on the use of either products email [email protected] and we’ll be more than happy to help, alternatively you can download the Soundscreen brochure here or data sheets here.